The Shakespearean Forest reimagines the real forests that our greatest playwright evoked in his works. The final book of renowned scholar, Anne Barton, it explores the changeable and sometimes sinister presence of the forest in literature and culture. Fear and forests, writes Shakespeare scholar Professor Anne Barton, go hand in hand. Forests are where we get lost and meet wild men, where chaos rules and anything can happen. Shakespeare uses forest settings, sometimes magical, sometimes menacing, in many of his plays. In As You Like It, the Forest of Arden is a place of freedom, transformation and love – but also hardship for the shepherds who work there. When in Macbeth Birnam Wood does come to Dunsinane, Macbeth knows he is doomed. Barton, who died in 2013, was Professor of English and a Fellow of Trinity College, Cambridge. Her many published works included Essays, Mainly Shakespearean (1994) and Ben Jonson, Dramatist (1984), and she was also an influential editor of Shakespeare’s plays. She was vitally interested in performance and staging, and her work has substantially altered and enriched the ways in which Shakespeare and other early modern dramatists have been understood and performed. Now Cambridge University Press has published The Shakespearean Forest, Anne Barton’s final book, based in part on her Clark Lectures in 2003. It has been prepared for publication by Dr Hester Lees-Jeffries, a former research assistant to Barton and now a Shakespeare scholar herself, and a University Lecturer in the Faculty of English. In an editor’s note, Lees-Jeffries describes Barton’s seminars, held in her beautiful rooms at Trinity College, as often intimidating but always with a sense of occasion. The six chapters of The Shakespearean Forest set the playwright’s work within a historical, social and literary world of forests, as well as exploring the surviving evidence for the ways in which forests might have been staged in the early modern theatre. The opening chapter reminds us how big a part woodland plays in the story of the British Isles. The English language is rich with references to wood and woods. We talk about ‘not being able to see the wood for the trees’ and ‘not being out of the woods yet’. We ‘touch wood’ to forestall ill fortune. If Britain is wooded today, it was much more so in Shakespeare’s lifetime. The names of these forests and woods entered the lexicon. The maiden name of Shakespeare’s mother Anne was Arden. 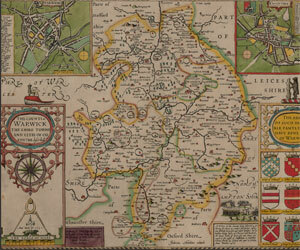 His birthplace, the town of Stratford-upon-Avon, was once surrounded by the ancient woodland of the Forest of Arden. It was even said that a squirrel could jump from tree to tree right across the county of Warwickshire. But this forest was already in decline in Shakespeare’s time. Trees provided timber for house and ship building, fuel for cooking and heating. In his Description of England in 1587, William Harrison commented that both England and Wales “have sometimes been very well replenished with great woods and groves, although at this time the said commodity be not a little decayed in both”. Shakespeare wrote for the ‘wooden O’, as the open-air, timber-framed Globe Theatre is described in the Prologue to Henry V. The origin of many of our current environmental anxieties can be found in the early modern period, and in the writings of Shakespeare and his contemporaries; they too were concerned by deforestation and pollution. Like the theatre itself, the forest is a place of transformation, growth and change. Forests were all about hunting – a pastime seen as preparation for warfare. Complex laws gave royalty rights and privileges to hunt deer and boar. Elizabeth I was a keen hunter, as well as being readily associated by poets in her courtly cult with Diana, virgin goddess of the hunt. Her successor James’ passion for the chase, writes Barton, “verged on the pathological”. He even insisted on being lowered into the gaping bellies of dead stags in the belief that the blood would strengthen his ankles. Poaching was widespread and, though illegal, was not regarded as socially disreputable. The gentry, and even nobility, engaged in poaching – either for fun or to pursue family vendettas. Popular tradition holds that Shakespeare, too, may have been a poacher in his youth. Barton paints a vivid portrait of a group of poachers as a motley crew of unruly thrill-seekers united by blood-thirsty machismo. More benignly, green men and woodwoses (wild men of the woods) are key characters in the dramatis personae encountered in fields, woods and forests. In medieval churches and cathedrals, leaf masks are carved into stonework as decorative motifs, stubborn leftovers from a pagan past. They are, observes Barton, “reminders that forests are places of transformation, where the boundary between human life and that of animals, plants or trees are likely to become confused, or even obliterated”. While for other dramatists, wild men were “a vogue that peaked and faded”, writes Barton, “Shakespeare’s interest in wild men seems to have extended throughout his writing career, taking in Oliver [As You Like It], Timon [Timon of Athens], the dancers in Bohemia [The Winter’s Tale], Caliban [The Tempest], Cardenio [The History of Cardenio] and (in a sense) Herne the Hunter in The Merry Wives of Windsor.” Elsewhere in the book she explores the various traditions of Robin Hood and Merlin the enchanter, both of whom make appearances in plays by Shakespeare’s contemporaries, including Ben Jonson. How did Shakespeare bring the forest to his audiences? A central question of Barton’s work is how Shakespeare might have brought the physicality of forest and woodland to the stage. There is no documentary evidence to show how early performances of Shakespeare’s plays led audiences deep into the woods. The only clue comes from the Netherlands in form of an engraving, dated 1635, which shows an elaborate indoor stage at a fair. In the background two tall trees are visible, perhaps waiting their moment in the next scene. To exemplify the effort and expense invested in creating spectacular entertainment, Barton describes in detail the extraordinary artificial forest commissioned by Henry VIII for a pageant performed to celebrate the birth of a son on New Year’s Day 1511. ‘La Forrest Salvigne’ took the form of a rolling stage (requiring 40 men to propel it) complete with a magnificent forest from which the king and three companions appeared, mounted on horseback and fully armed. Barton’s interest in the staging of Shakespeare’s plays reflects the way her own life brought together the worlds of theatre and academia, not least in her marriage to the director John Barton. In an afterword to The Shakespearean Forest, Shakespeare scholar Professor Peter Holland writes that many of Barton’s students became actors and directors and that many of her research students (including Holland himself) wrote dissertations centrally concerned with the questions of performance in early modern drama. The Shakespearean Forest by Anne Barton is published by Cambridge University Press.